The playfulness of the songs, the themes, the rhythms that embrace the songs and the lyrics all tell us tales about existing and imaginary people, real and imaginary events, and depict familiar atmospheres. 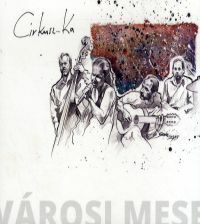 When recording the tango-chanson tracks of the album it was of primary importance to reflect what the three-member formation performs on the stage: to retain the wonderful colours of live acoustic music, to involve the listener into the intimate, fragile and humane world of chamber music. 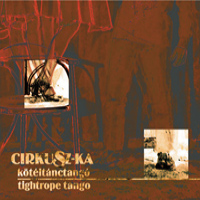 Kötéltánctangó (Tightrope Dancer Tango), as the title indicates, is a manifestation of this sometimes playfully light, sometimes virtuouso, or fragile and minimalist performance that operates with the slightest (musical) gestures. Let’s give each and every sound their own value and meaning, and let Cirkusz-KA lead the listeners’ imagination in their wandering of various worlds.